The subway was worse. Hot and sticky, the trapped heat pooled on the platform with nary a breeze to stir the air. After a long wait, my train arrived and I managed to grab a seat in the air conditioned car, not that it helped much. Sweat ran in rivers, people’s motions stilled, and grim thoughts surfaced each time the subway car doors opened and the sweltering heat from outside rushed in. Summer has begun, and it is doubtful we’ll have respite until fall. Knowing the heat was coming, I saved this post until now. On hot days the thought of heating up the stove to cook a meal makes me shudder, and the though of eating out becomes more and more appealing. And so with pleasure, I bring to you Haru. 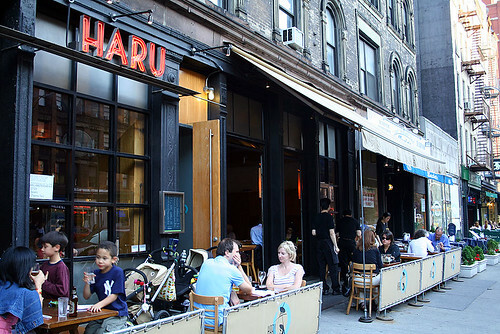 A great sushi restaurant open in the evenings up on 81st and Amsterdam. Before you run away because you hate fish, let me just say that not all sushi includes fish. I myself only like the vegetarian varieties. No, I’m not vegetarian, I’m just not to partial to raw fish. Let me take you on a brief visual tour before I sign off for today. They have nice outdoor seating if the weather happens to be nice. They have nice spring rolls. 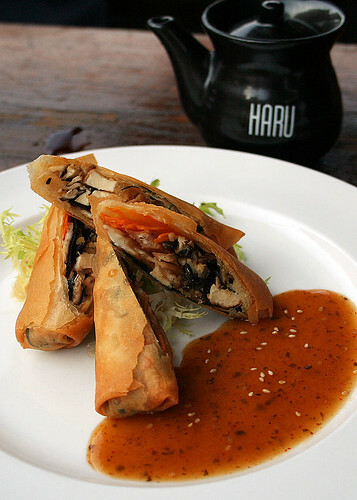 Vegetable Spring Roll with pickled plum sauce. This is usually what I order. 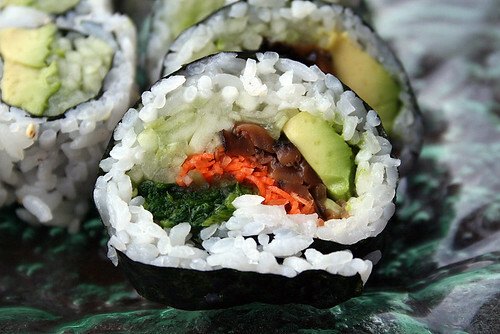 A vegetable roll and cucumber avocado roll. And this is what the couple sitting next to me ate. Quite a feast for the eyes, isn’t it? 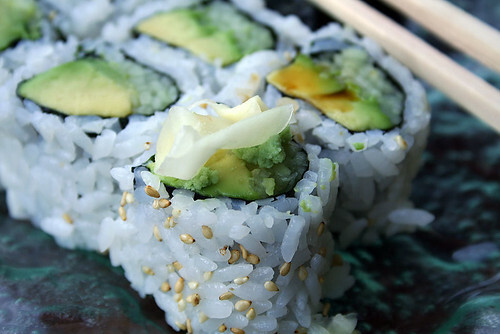 They are friendly, the food is yummy, and the ambiance is perfect for sushi. Just keep in mind that they open at 5:00 on weekdays, and 12:30 on weekends. We love Haru!! DW can't get enough of the salad with ginger dressing ("it's divine", she reminds me). 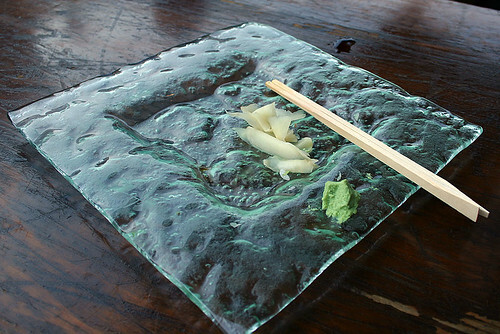 We have a couple of sushi restaurants that are closer, but this one is tops. Roppongi is good too (across the street) but this is definitely our standby. 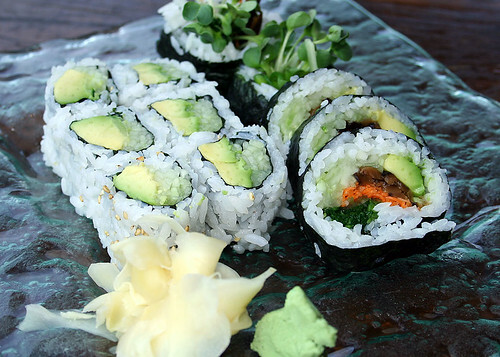 Don't say a word, crunchy spicy salmon roll -- you had me at hello. 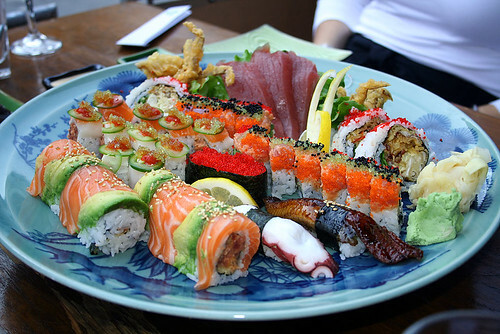 I...LOVE...SUSHI!! I just wish I could afford to buy it more often. it such a beautiful food, too, that it seems such a shame to eat it. Almost. I meant to comment on how great these (and all of your food) shots are. What kind of lighting are you using? Au natural? I'm thinking outdoors light on some, but the flikr page didn't post your camera settings. Hi uncadan8 and columbia, thanks! Glad you liked the post. When I get home, I'll check the original file to check the metadata on the pics. I ate outside in front, so there was natural lighting, but I took some shots with and without the flash but at this point am not sure which ones I used. As for flickr...I know, I need to start saving my photos differently. I currently use the 'save for web' feature in photoshop, and it strips out all the data from the photo. I recently noticed most flickrites leave the data in, ...so I should probably change my ways to be helpful for those who want to know more. columbia do you have a flickr account? If so, do you use the regular save feature?